CT (Computed Tomography) is a valuable diagnostic medical exam that combines X-rays and computers. 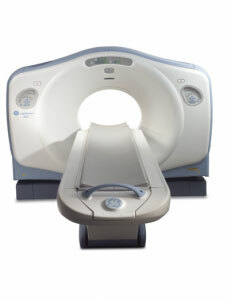 Often called CAT scans, CT scans have been performed successfully for almost thirty years. A CT scan gives the radiologist a non-surgical way to see inside your body. One advantage of CT is its ability to rapidly acquire two-dimensional pictures of your anatomy. Using a computer, these 2-D images can be presented as 3-D images for in-depth clinical evaluations. CT scans create high-definition pictures of both bony structures and soft tissue, as well as, clear images of organs such as the brain, muscles, joints, veins and arteries. The actual scan, which acquires X-ray images of your body, takes only a few seconds. However, the rest of the CT exam takes longer as the images are processed on the computer. Depending on the specific exam, you may have to hold still for a few seconds during the X-ray portion. An average CT study takes approximately 10-20 minutes depending on the circumstances. Depending on the exam, a solution called “contrast” may be administered with an IV to help improve the accuracy of the examination. It is very important to let your doctor know beforehand if you’ve ever had an allergic reaction to contrast, or if you have any other allergies, especially to iodine-based products or shellfish. The radiologist will carefully analyze your CT images, review the findings with your physician, and provide a report. Your physician will then discuss the results with you. Like many other radiology imaging technologies, CT has been cleared by the U.S. Food and Drug Administration. CT is a safe and effective diagnostic procedure. In fact, millions of CT exams are performed in the U.S. every year.